Earlier this week I wrote a blog post about Building Better Answers in Math. As I said in that post, the strategies I have been using to build better answers in math were inspired by how we've been building better reading responses all year long. All year we've been "Building Better Reading Responses." The system that has really worked for my students when building better reading responses is very visual. We've been colour coding our reader responses according to the success criteria we've slowly built together over the course of the year (I only add a new goal every three or four weeks - allowing for student mastery of the previous goal before we move on). These criteria are posted on a bulletin board, so the students can easily refer to it when writing their responses. 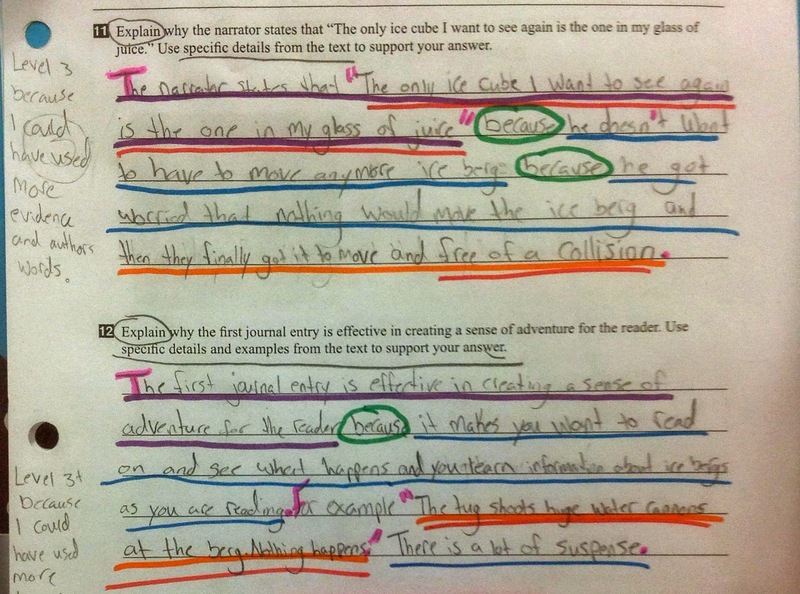 With this method, students can easily see what they've included, and just as easily identify what they have not included in their answers. I am a huge advocate of students accountability and reflection, and this method makes it so easy for students to reflect on their answers, identifying their strengths and areas for improvement. We also do a lot of work with peer and small group assessment. Each time we add a new goal to our success criteria, we write about it in our reading response journals (just a simple 3-hole notebook). 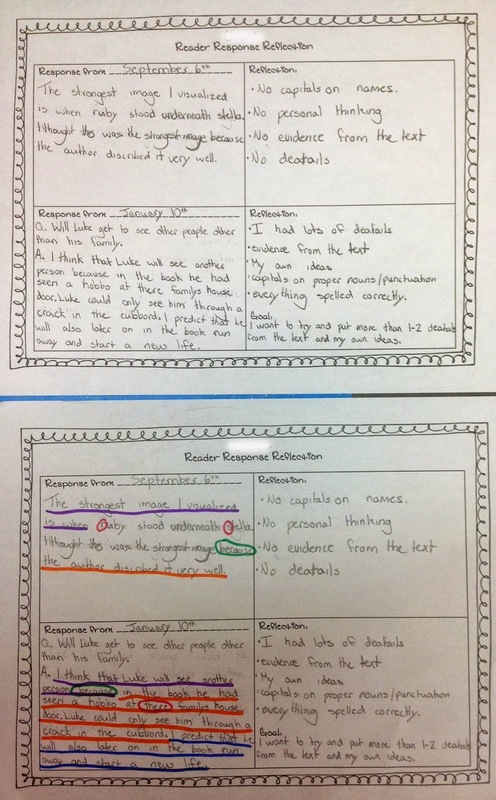 We write about our learning goal, why good readers include the goal in their responses, and then students complete a personal reflection based on the goal. From that point forward, students are to colour code evidence of the goal added (as well as previous goals) in their reading responses. One of my favourite activities we've done with our reading responses this year is a reflection of how our answers have grown over the year. 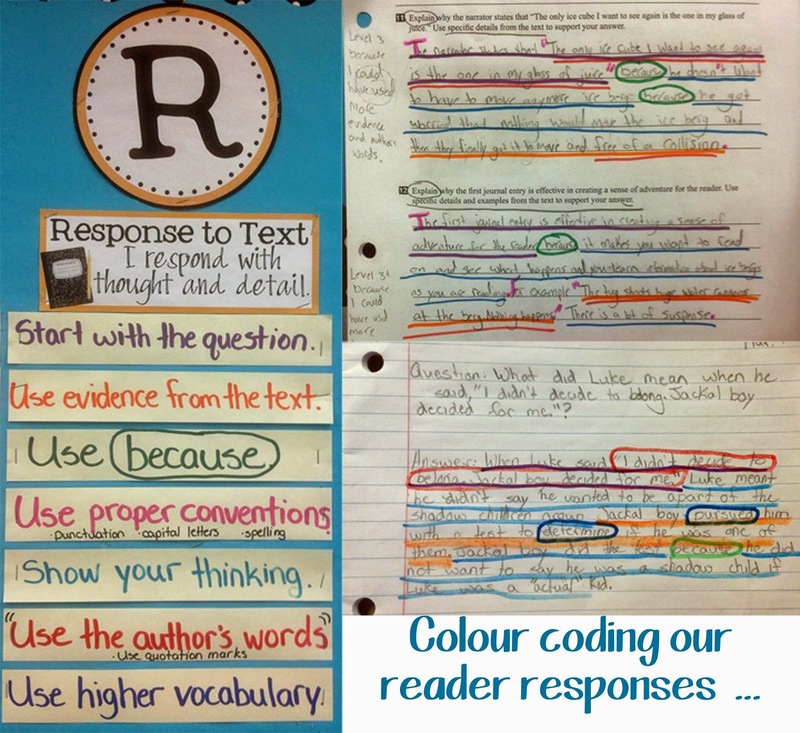 I asked students to choose a reading response they wrote at the beginning of the year and colour code it according to our criteria. 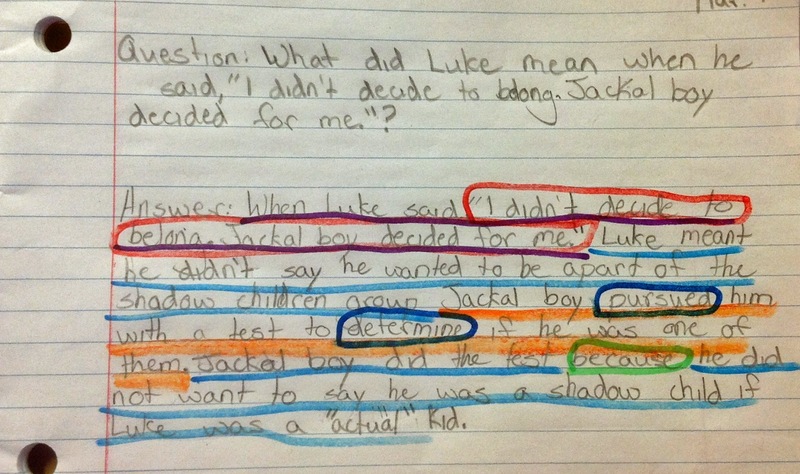 They then chose a current reading response they had written, and compared it to their earlier response. They were amazed when they reflected on the growth they had made ... and so was I. :) We did this activity at the half-way point of the year, and I plan to do it again at the end of the year. I've shared a lot of our activities on my facebook page this year, and have had quite a few requests to turn this system into a resource to share. So, I was happy to oblige. :) Building Better Reading Responses is based on this system I use in my classroom, and will work with any reading material used in your class - fiction, informative text, or poetry. It includes a list of colour coded reading response goals / success criteria - you can use this as a clip chart for tracking individual goals, or as a whole group cumulative list of success criteria (how I use it in the classroom). The resource also contains success criteria checklists for students, peers, and the teacher, as well as a more formal rubric. There is a poster to help students remember the goals, as well as student bookmarks with the goals on them. 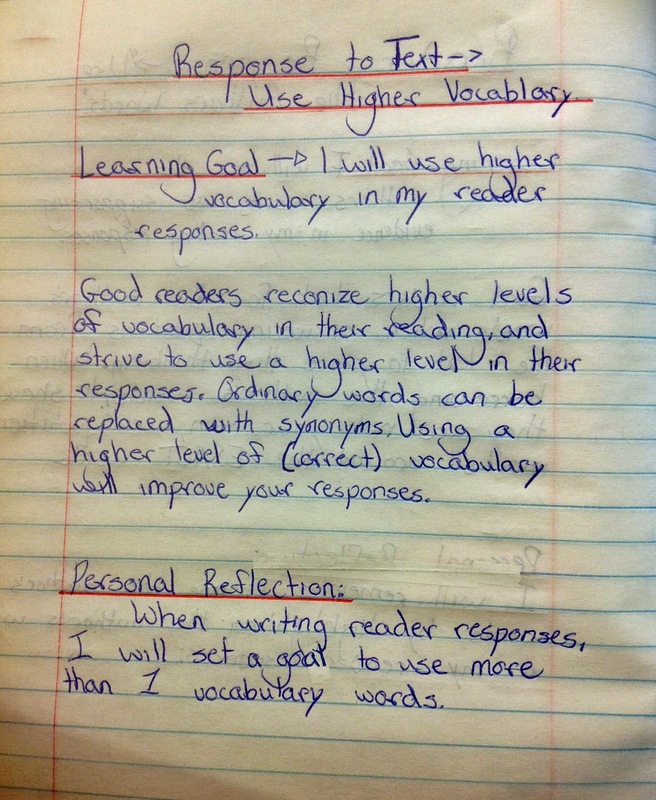 I have included scaffolded sheets for the students' reading response notebooks - "good reader" notes with the learning goals and explanations, as well as reading response worksheets that have the success criteria listed on them (scaffolded so they only include goals covered in class at the time). I have also included some different reading response sheets and activities for individual, partner, and small group work. You can see a full preview of the resource by clicking HERE. I've included a peek below. I think this is awesome! Thank you for creating it for TpT! I'm wondering how often you have students turn these in? One for every mini-lesson? Once a week? I do a formal assessment every 2 months or so, we do quick checklist assessments every couple of weeks (I collect one or two groups' books each week). That being said, I do walk around and give oral feedback to students all the time when they are writing their responses. I would love to come watch you teach for a week! Is the only part of your board the R? Or do you have other parts?